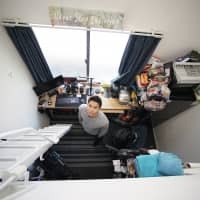 Six years ago in March, a firefighter in the town of Namie in Fukushima Prefecture couldn’t save tsunami victims in the wake of the Great East Japan Earthquake, because he himself had to evacuate due to the nuclear crisis at the Fukushima No. 1 power plant. 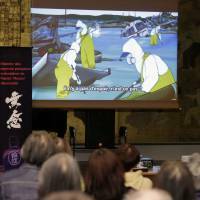 His anguish has been illustrated in the animated film “Munen” (“Remorse”), which was shown in France at Maison du Japon of Cite Internationale Universitaire de Paris on March 25 this year following screenings at various places in Japan. The film begins with a scene in which the wife of the firefighter explains to her niece why her husband puts his hands together everyday and looks toward Namie. “He is apologizing to lives that he could not save,” she tells her niece. At the screening in Paris, the audience of about 100 people stared at the screen. The crowd erupted in applause when the film ended. France depends heavily on nuclear power, which produces 75 percent of its electricity. “I could understand clearly the seriousness (of nuclear power). I want many French people to watch this,” said a male university professor. 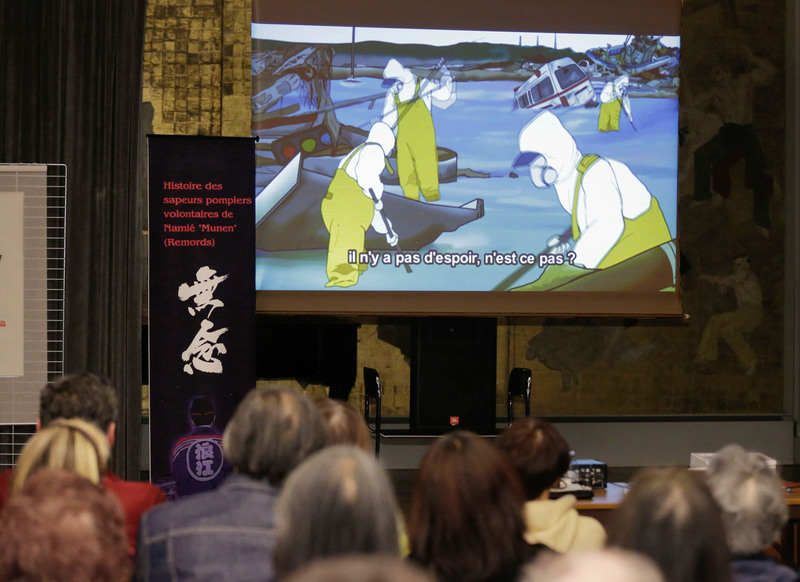 A citizens’ group that created the film has also produced about 40 illustrated story performances in the last five years, featuring experiences of evacuees of the nuclear disaster and a folk tale set in areas that have emptied of people. The shows have also been screened at various locations. One story called “Mienai Kumo no Shita de” (“Under the Unseen Cloud”) depicts the life of a female evacuee from Namie. Another called “Yuki-kun no Tegami” (“Yuki’s Letter”) features an autistic boy who struggles in an evacuation center, while a work titled “Inochi no Tsugi ni Taisetsuna Mono” (“The Precious Thing Next to Life”) is based on a story from the disaster that a manager of an inn heard from a fisherman. “Munen” was also based on an illustrated story. “An illustrated story show is easy and inexpensive (to produce). It tends to win the sympathy of the audience as it stimulates their imagination,” said Hidenobu Fukumoto, who heads a group called Machi Monogatari Seisaku Iinkai (Town Story Production Committee). The 60-year-old former official of the Hiroshima Municipal Government was born in Hiroshima and graduated from Hiroshima Shudo University. At the city office, he was involved in publishing a public relations magazine and event planning, with many opportunities to create illustrations. He retired in March. 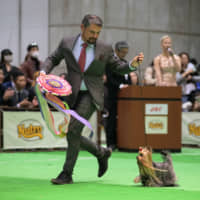 What prompted him to create the shows was a book about the relationship of the atomic bombing of Hiroshima and the nuclear plant in Fukushima operated by Tokyo Electric Power Company Holdings Inc. He read the book when he was engaged in volunteer activities in Fukushima after the disaster. The book by Hisato Nakajima, titled “Sengoshi no Nakano Fukushima Genpatsu” (“The Fukushima Nuclear Power plant in Postwar History”), includes the story of a Tepco employee who was involved in the construction of the Fukushima No. 1 power plant. The man, who lost his older brother in to the atomic bombing, also helped rescue atomic bomb survivors. In around 1964, he was assigned to work in the town of Okuma in Fukushima and talked to local people who were concerned about hosting a nuclear plant. 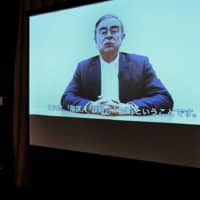 Fukumoto was shocked to learn that the man’s atomic bombing experience was used to convince people to accept the construction of a nuclear power facility. Meanwhile, the book also tells about a landowner in Namie — where Tohoku Electric Power Co. had planned to build a nuclear power facility — refusing to sell his land because he witnessed the devastation following the atomic bombing of Hiroshima. 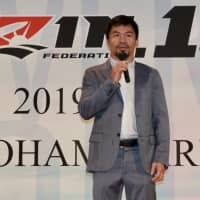 “In the 1960s when I was in elementary school, atomic bomb survivors in Hiroshima refrained from talking about the bombing over fear of being discriminated against,” Fukumoto said. 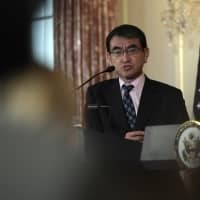 “If the horror of the atomic bombing had been conveyed better, people in Fukushima might have become suspicious about being persuaded, and nuclear power plants would not have been built,” he said, adding that if Fukushima becomes silent, the silence could be used as an excuse for maintaining nuclear power. In order to prevent that outcome, Fukumoto is determined to convey the stories of remorse triggered by the meltdown disaster, the stories of evacuees, and the individual personalities of the victims. Every month, Fukumoto makes a round trip of around 800 kilometers between Hiroshima and Fukushima to hold interviews to create new stories. 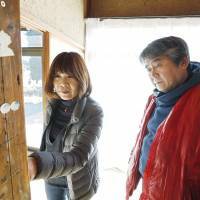 On Jan. 31, he visited the Namie home of 56-year-old Yoko Oka. Oka evacuated to the city of Fukushima, as her home was in a restricted zone which allowed only daytime access. The restriction was lifted at the end of March this year. Her home was almost empty after she threw away everything but a chest, which she brought after getting married. There were many holes in the paper doors because they were devastated by masked palm civets, which also scattered feces in the home. Oka stood in front of a pillar marked with the heights of her two daughters. “This is the only proof that we lived here,” she said. Fukumoto listened carefully to Oka and photographed her. 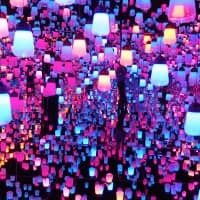 Based on such interviews, he uses his computer to make illustrations for new stories and write scripts. 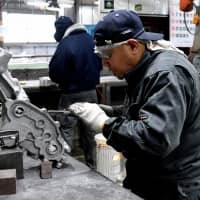 The production group currently has around 10 members, including a hibakusha from 72 years ago. The survivor continues to contact Fukushima evacuees, believing it is not someone else’s problem as they both were exposed to radiation. There are also many evacuees who perform similar shows in various places. 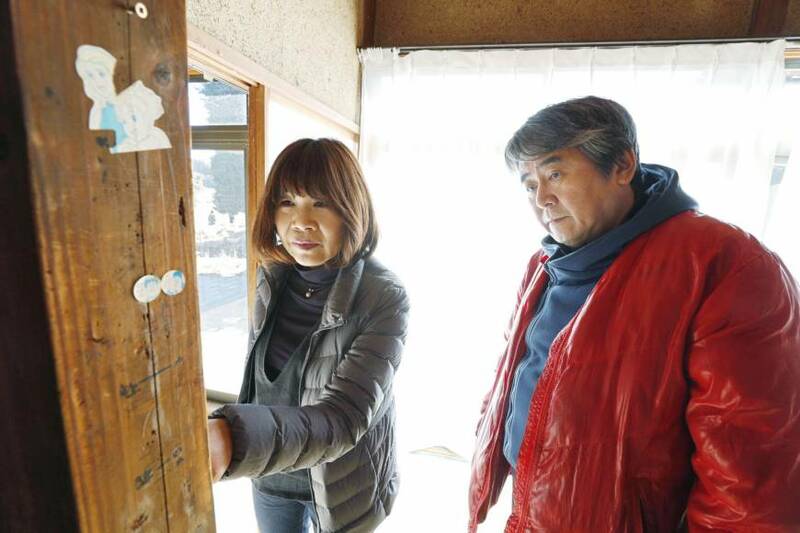 Hisai Yashima, 51, who evacuated to the town of Kori, Fukushima, belongs to a group of around 15 storytellers. After hearing the experiences of those who survived the atomic bomb in Hiroshima, Yashima thought the prejudice echoes the discrimination suffered by the Fukushima nuclear disaster evacuees. But she is proud that the group was able to visit some 500 locations to screen shows. “We are able to send out (our message). We will never let people become silent like in Hiroshima,” Yashima said.